The library’s new Assistive Technology Learning Center is home to computers and iPads with magnifications and speech software. The software makes it easier for visually impaired patrons to use digital devices. New technology at the Cherry Hill Public Library is making it easier for visually impaired residents to use a computer or iPad. The library recently opened its new Assistive Technology Learning Center that provides adults 55 years and older who have had changes in vision a chance to use digital devices with greater ease. The library acquired four new computers and four new iPads with built-in assistive technology software allowing users with visual impairments to use technology with greater ease. 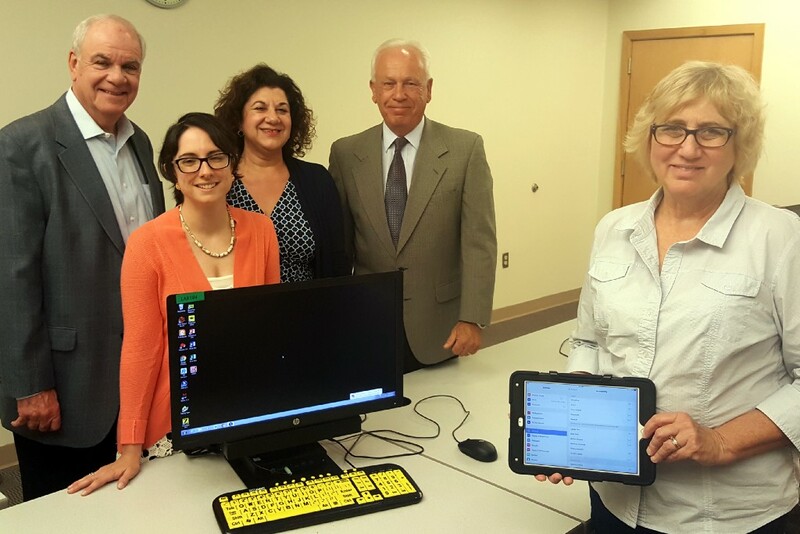 The library partnered with the New Jersey Commission for the Blind and Visually Impaired and the New Jersey State Library Talking Book and Braille Center to bring the technology to Cherry Hill. Only six other libraries in New Jersey have been provided with the devices. Cherry Hill is the only library in Burlington, Camden and Gloucester counties with the technology. T.J. Lamanna, the Cherry Hill Public Library’s emerging technologies librarian, said the new technology fills a niche in the library’s services. Lamanna said there is a sizable group of people who want to use digital devices, but are unable to due to problems with their vision. The Assistive Technology Learning Center gives people with changes in vision the tools to use digital devices. The library’s four new computers include software such as JAWS, Magic, Talking Typer and ZoomText. These programs allow the user to enlarge the screen, type on the computer through speech, have text on a screen read aloud and more. The new iPads also have various built-in features allowing users to magnify the screen. Sponsored by the New Jersey Commission for the Blind and Visually Impaired, the Library Equal Access Program has provided the library with the new technology. In addition, LEAP is offering free classes for adults 55 and older to introduce them to technology. The classes are for beginners who want to receive training on the computers and iPads. Since there are only four devices available, classes fill quickly. Participants spend the first two months getting acquainted to the iPad. The class then moves on to the new computers in the following two months. Advancing Opportunities, an organization providing various disability services throughout the state, leads the training sessions. Lamanna said participants are gaining familiarity with the technology. Outside of classes, the new devices are available for anyone to use. Since the assistive technology devices are not available at other libraries in the area, users do not have to be a Cherry Hill Public Library cardholder to use them. The devices are located in the computer lab on the lower level of the library. Those wishing to participate in the training classes can call Advancing Opportunities at (888) 322–1918, ext. 595 to sign up. For more information on the library’s Assistive Technology Learning Center, call (856) 903–1243.